There's nothing wrong in jumping on the bandwagon, provided it is done well and considering that Singstar is more popular than the Guitar Hero franchise, one can understand why Sony have decided to include the guitar peripherals to their latest Singstar title... Like Guitar Hero, the Singstar franchise was becoming a little long in tooth but with the ability to add guitars to your gameplay, things have become a lot brighter in this world. Supporting up to four players, two on microphones and two on guitars, Singstar Guitar definitely adds a new twist to this franchise. As we all know, not everybody enjoys karaoke and now these people can join in the fun with similar gameplay as Guitar Hero and Rock Band. Best of all, these peripherals and just about every other third party guitar hero peripheral is compatible with Singstar Guitar. It's that easy! 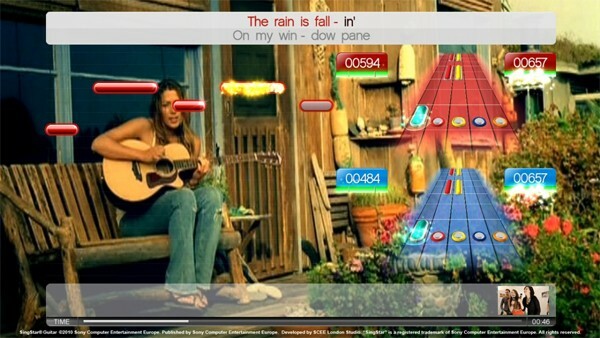 As mentioned, Singstar Guitar is almost identical to the last Singstar game but you now have the ability to use guitars. The karaoke aspect is just as good as ever but if you're looking for a challenge like Guitar Hero, the guitar aspect of this title is a little simplified. Given that, the game is definitely more suited to the casual market but I still enjoyed using the guitar for songs like The Man Who Sold the World (David Bowie) and My Delirium (Ladyhawk). This game has quite a good mainstream track listing with something for everyone, especially if you want to kick back solo or with friends. 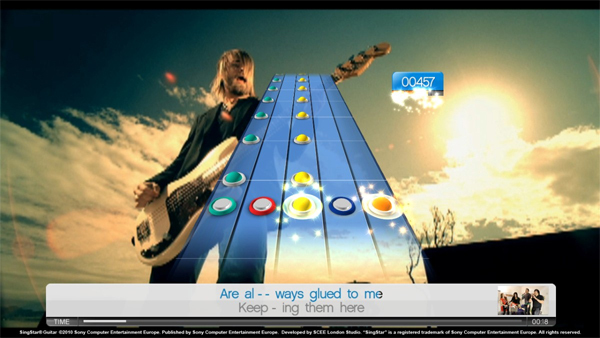 The "Singstar" karaoke component remains in tact with players needing to match their words with those displayed on the screen and you are awarded points for your rhythm and timing. For online, Sony have promised to release new tracks via the PlayStation Store which is a good incentive. With the guitar, you have to match the coloured notes on screen with those on the guitar, just like Guitar Hero and Rock Band. If you do miss it, you are only penalised via a low score. It's basic but it works. But if you're looking for a career mode than you've come to the wrong place. As a party game, it's entertaining but for something challenging, the gameplay is a little limited but there are three different levels of difficultly with no true "power-ups" like Guitar Hero. At the end, you are awarded a score and that's probably your biggest challenge, attempting to beat the score. The hardest setting of difficulty is reminiscent of Guitar Hero though. Given these facts, the gameplay works and we thoroughly enjoyed it. 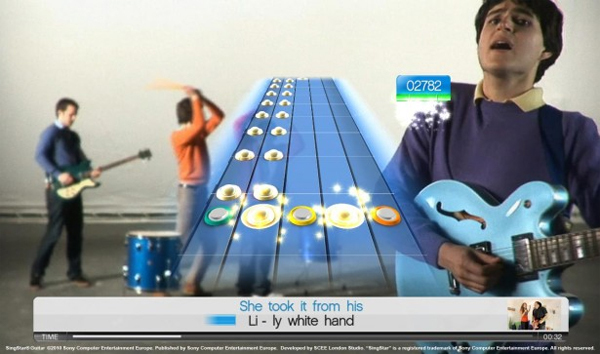 In conclusion, Singstar Guitar may be just a cash-in on the people who enjoy the Guitar Hero franchise but it does add a new element to Singstar, especially by drawing in those who may not want to sing. 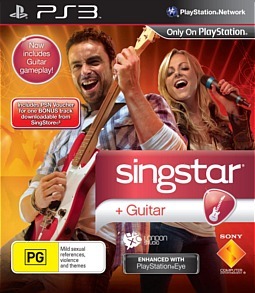 It may not have all the bells and whistles of the other "guitar" games but it's still an entertaining experience that definitely enhances the original Singstar premise. Not bad at all!